Microsoft has today unveiled the newest member of its Lumia smartphone family, the Lumia 830, describing it as the first “affordable” Windows Phone flagship device. It’ll arrive costing around €330 in Europe and will start shipping this month. Software-wise, you’ll find Windows Phone 8.1, Cortana (market applicable) and Microsoft’s usual range of products and services, like Office and OneDrive. Naturally, you’ll find an array of Nokia Camera apps and bespoke features. On the hardware side, there’s a quad-core 1.2GHz processor, 5-inch display and 10-megapixel camera (capable of capturing 4K video) on the rear. It measures 8.5mm thick and weighs 150 grams. For comparison, the iPhone 5s weighs 112 grams, but has a smaller screen, which explains some of the weight difference. Unlike some Lumias of the past, the back cover is removable (and supports wireless charging) and has a microSD card slot for adding up to 128GB of additional storage. On board storage is set at 16GB. Aesthetically, the square-edged device takes more cues from its siblings like the Lumia 930 or 925, rather than the more rounded Lumia 920 or 1020 of the past. Microsoft also went to pains to point out that the Windows Phone app store now has more than 320,000 apps available to download, including many of the biggest names. As part of a firmware update called Lumia Denim, the company said it has tweaked some of the camera features, like Nokia Camera, to make it faster to capture and edit a picture. The firmware update will also introduce a new feature for Cortana, its smart assistant, to make it possible to say “Hello, Cortana” to start using it, just like “OK, Google”. Lumia Denim will also add support for Live Folders, similar to Live Tiles, that contain groups of apps and a built-in consumer VPN feature. While Cortana is currently restricted to the US, Microsoft confirmed it will be coming to the UK in October. This firmware update will roll out first to the Lumia 930, 1520 and Icon first (the 830 will ship with Lumia Denim) and will be available for all Windows Phone 8.1 devices in Q4 this year. 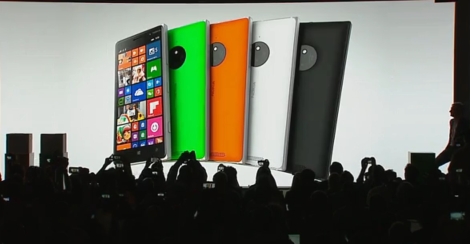 Microsoft said it would also launch the Lumia Camera App for these devices before the end of the year. Microsoft also launched a new device to make sharing content to a TV screen easier and a new ‘intelligent’ wireless charger (Smart Wireless Charging Plate) that lights up, which can be customized to alert you to incoming calls, messages, etc. The charger will be available in green, orange or white.